9.5"H , Resin and stone mix, Breast Cancer Angel exhibits symbols relating to breast cancer awareness. Message: You have lifted yourself beyond the realm of courage. May the spirit of Peace and Hope shine as your strength. 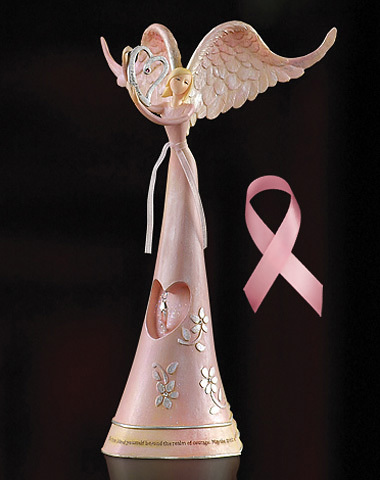 This beautiful angel is a touching gift for loved ones and survivors of Breast Cancer. Her message is to empower those who receive her with the spirit of Peace and Hope. She holds an open heart engraved with the words "Peace and Hope" symbolizing strength. The pink sheer ribbon that is tied around her waist represents hope and awareness. The pink ribbon charm decorated with crystals that hangs within her skirt represents the strength that shines from the many breast cancer survivors that inspire us with their hope.